I am. Then they can see all the glory you gave me because you loved me even before the world began! you looking for?” he asked. 5 “­Jesus the Naz­a­rene,”* they replied. off the right ear of Mal­chus, the high priest’s slave. his followers and what he had been teaching them. where the people* gather. I have not spoken in secret. slapped ­Jesus across the face. “Is that the way to answer the high priest?” he demanded. 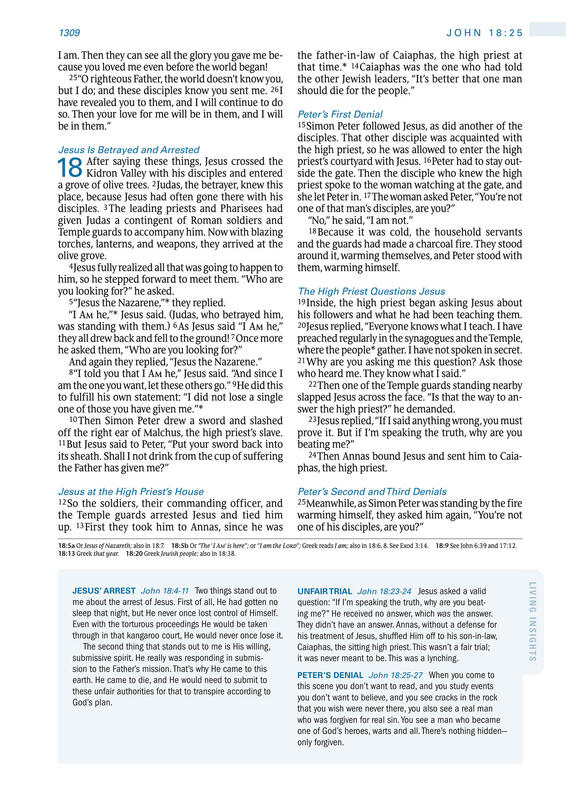 18:5a Or Jesus of Nazareth; also in 18:7. 18:5b Or “The ‘I Am’ is here”; or “I am the Lord”; Greek reads I am; also in 18:6, 8. See Exod 3:14. 18:9 See John 6:39 and 17:12. 18:13 Greek that year. 18:20 Greek Jewish people; also in 18:38.
sleep that night, but He never once lost control of Himself. through in that kangaroo court, He would never once lose it. question: “If I’m speaking the truth, why are you beating me?” He received no answer, which was the answer. it was never meant to be. This was a lynching.